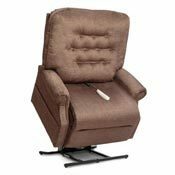 Power Lift Chair Recliners by Pride Mobility come in a wide range of types, from 2-Position and 3-Position electric lift recliners to Infinite-Position electric lift recliners. 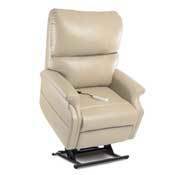 Pride power lift chairs help make getting up from a seated position so much easier for seniors. With so many brands on the market, NewLeaf Home Medical has chosen to exclusively offer America's #1 Lift Recliner Brand—Pride Power Lift Recliners. There are so many styles, colors and materials available, where do you begin? 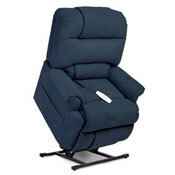 The following overview has been specially developed to give you coveted insight into the different types of power lift recliners and how they might best suit your unique needs. Let's get started! Pride Infinity LC-525iL Infinite Position Chaise Lounger - Users 5'9" to 6'2"